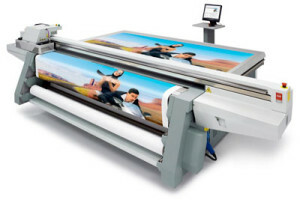 Enhance your business offerings by taking advantage of our innovative large format flatbed printer and I-Cut Digital Trimming Workflow. 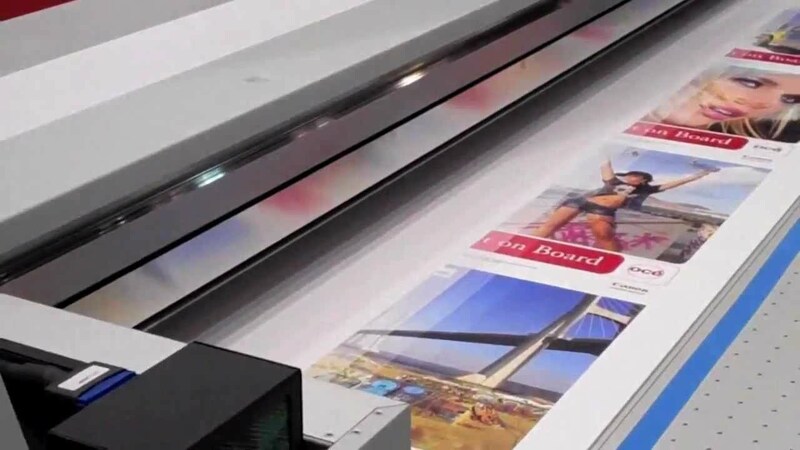 Our flatbed printer uses UV curable inks and Océ VariaDot imaging technology to deliver near-photographic image quality on every print. You can print on irregularly shaped objects or non-square media, heavy substrates such as glass, or materials that have an uneven surface such as wood. Add value to a metal cookie box, a DVD, a piece of furniture, a pane of architectural glass, a sheet of painted aluminum, wood, MDF, or even a full-sized garage door. Using the White Ink option to its full effect we can print on clear materials and add white to make it stand out. 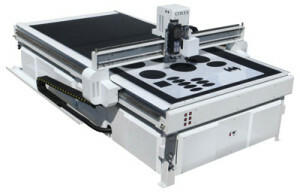 Our flatbed printer offers unparalleled versatility. 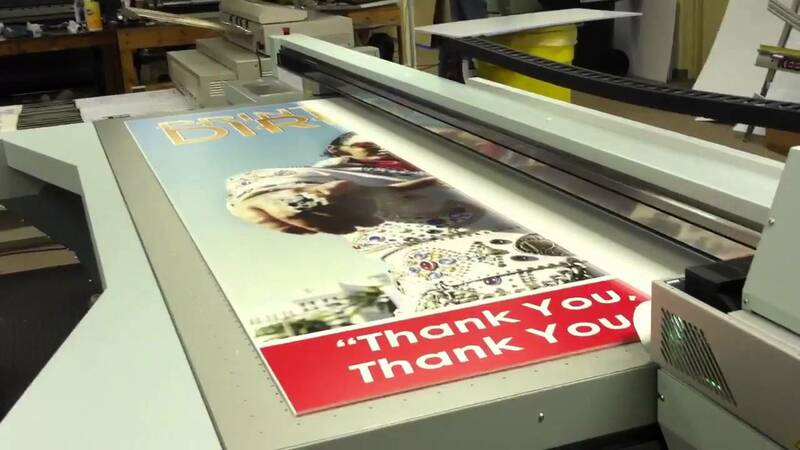 The final step in producing large format graphics occurs in the finishing department. If a mistake is made here, we all have to start over. When that happens deadlines are put in jeopardy and tensions can rise not to mention the waste in materials which factors into final costs. Manually trimming various substrates limits what can be produced, is labor intensive and can be difficult to say the least. 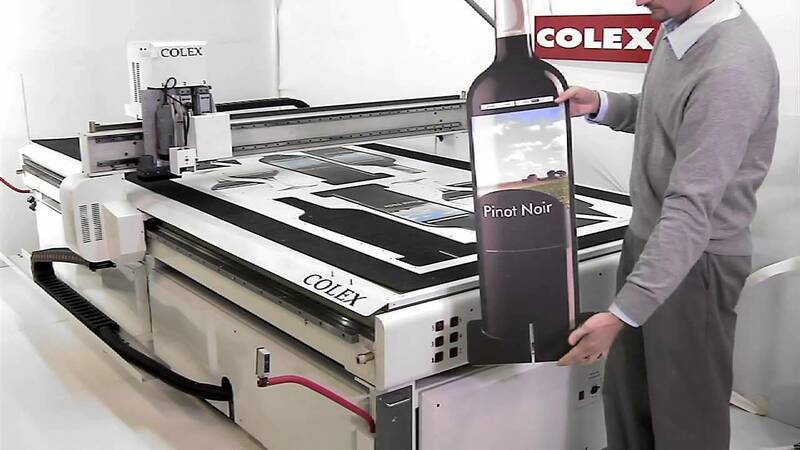 That is why we invested in the Colex Digital Die-cutter with routing capabilities and I-Cut Software. As the leader on your project we understand the challenges you have in managing all facets of your job. If there is a mistake at the end and deadlines are missed, you look bad and in turn we do as well. That is a situation no one wants. So how do you insure your quality and deadline needs will be met? As your caretaker of large format graphics, displays, signs and exhibits seek we strive to not only possess a great toolkit at their front end, but at the back end as well. This very concept was written about by Cassandra Ballentine in the January 2015 issue of Digital Output magazine. 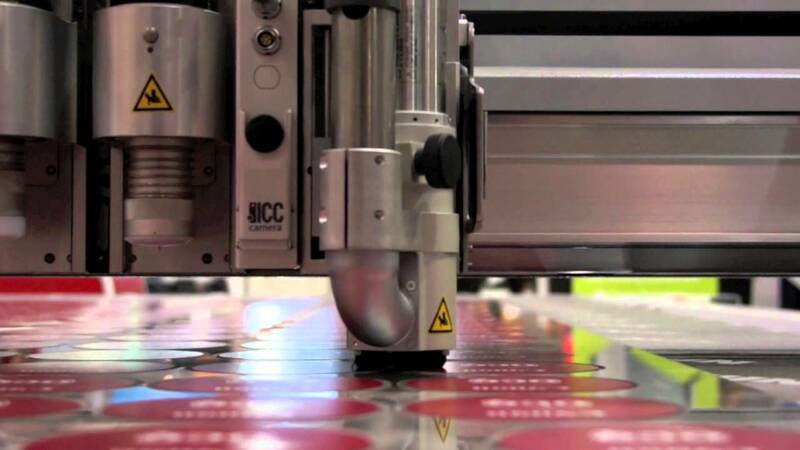 The message is,”automation is king” and that all print service providers of large format graphics should be investing in the automation of the finishing process! This whole process approach will get you what you need need! Maintaining superior quality in a time efficient manner is what we do. In your search for a trusted large format graphics provider, always look for this type of equipment at the front and back ends. This is why we have optimized our workflow this way. 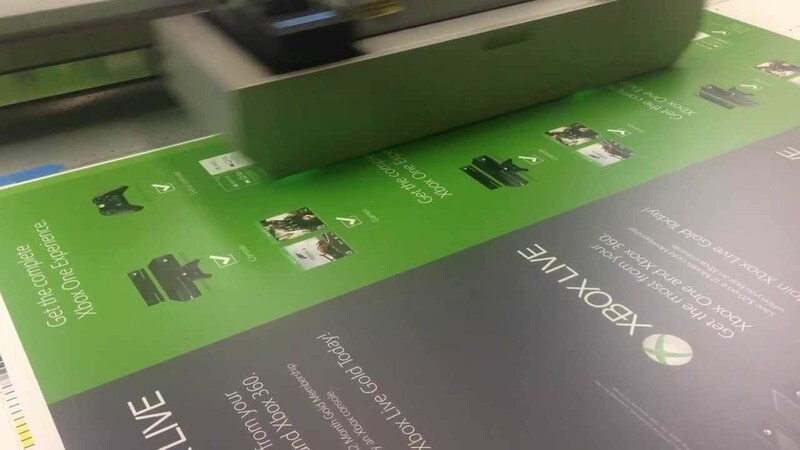 Our system allows for “advanced nesting” of your graphics, such that the single substrate is efficiently ganged all on one sheet whenever possible. This not only minimizes materials waste it also means your job gets done even faster when multiples can be trimmed out almost simultaneously. An entire set of graphics can be cut out in just a matter of minutes, instead of several hours or days. This becomes even more important when contour cuts are required for your order! Different types of cuts can now be accomplished quickly and accurately, every time quickly and efficiently. The digital cutter / routers (CNC) can handle many tasks at one time. Using a laser eye and positioned markings tied to a look up table in our workflow it automatically knows where to cut and the shape too – all without any handwork in the process. This investment provides immense flexibility in meeting your turnaround times in combination with increased accuracy and reduced material waste insures consistent production on order after order and a cost savings to you because of the automation at work on every job. We can take care of your signage and banner needs. Items can be produced on vinyl, styrene, ultraboard, aluminum, wood, coroplast, acrylic. Substrate can be up to 2” thick. Size can be up to 8’ wide and length is unlimited. We can also die cut your piece meaning that it does not have to be a straightline cut. We have the people and technology to work with nearly any type of file. Native Indesign files with fonts and links are preferred. We are G7 Master Certified guaranteeing color consistency throughout the workflow process. We can produce short run full color brochures, envelopes, booklets, stickers, flyers, clings, business cards, and more. We can produce your large run catalogs, posters, booklets, and more. Items can contain 1-6 colors and/or be full color two sides. We can apply UV or Aqueous coating as well. We can saddle-stitch, perfect bind, drill, pad, collate, various folds, trim, die cut, shrinkwrap, glue and much more. We meet USPS postal requirements for NCOA and addressing. Inkjet address in 4 colors. We combine thermal inkjet technology with Windows-based user interface to make printing variable text simple and fast. Machine insert up to a wide range of 6 pieces and seal. Application of wafer seals your direct mail pieces. We can print and ship on-demand with our pick and pack inventory management reports system. Full warehousing to store your items. Track your items through FedEx, UPS, or courier. Custom notification when inventory is low and reorders need to be made. Management reports weekly, monthly, quarterly to ensure correct counts. Manage an online Web-to-Print site for all of your on-demand needs.